Post-tensioning concrete further enhances the benefits of concrete framed structures. The adoption of concrete post-tension floors allow the engineer to provide the client and architect with an efficient flexible design. Engineers understand that concrete is good in compression but weak in tension. The introduction of a post-tension system into the concrete slab allows the element to be pre-compressed therefore when it starts to flex under applied loads it remains in compression. When load is induced into pre-stressed slabs the element starts to bend, thus reducing the amount of pre-compression that has been applied. When the applied load is removed the slab returns back to its original state. Provided that applied loading does not induce a greater tensile stress than the amount of pre-stress within the slab the concrete will not crack within the tension zone. Cracks will only appear when the stresses from the applied loads exceed the applied pre-stress. Post-tensioned systems consist of 2-5 tendons within a duct at centres that typically range from 1.0 to 1.5m. These ducts run in both directions in the slab and are profiled at high points and low points so the duct follows a parabolic shape that reflects the bending profile of the slab i.e. high points over supports and low points at mid span. At the end of each tendon is a live end (anchor). The live end is where the anchor is placed which is used to lock the strand (after jacking) into a pre-determined tensile force. It is these tensile forces that induce the pre-compression forces into the slab. Depending on the length of the tendons the other end will consist of either a dead-end anchorage or where the tendon exceeds a certain length another live end. The pre-compression is applied to the slab once the concrete has been placed and has reached a pre-determined strength. Each tendon is stressed against the concrete and locked off by special anchor grips known as split wedges. This system also allows the tensile forces to be transmitted directly into the concrete. No stresses are applied to the formwork therefore a conventional system can be used. Once all the tendons have been stressed the ducts are fully grouted so there is no longer any reliance from the anchor to transfer the pre-compression onto the section. The design of flat slabs is normally governed by the deflection requirements or the punching shear capacity at supports. 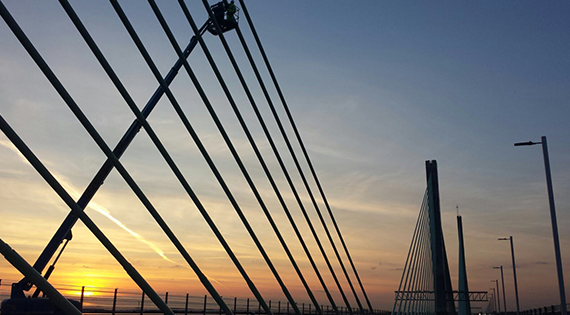 Post-tensioning helps improve the control of deflections and therefore provides much more efficient span/depth ratios then more common structural solutions. The post-tensioning also helps enhance a slabs shear capacity as part of the pre-compression can be used when determining the punching shear capacity. Recommendations for the design and detailing of post-tensioned slabs are provided in Eurocode 2: Part 1-1 and further guidance is given in the Concrete Society Technical Report 43. Post-tension slabs will provide the minimum floor thickness of any solution for typical spans and loads. This therefore reduces the self weight of the structure and helps create further savings in the supporting columns, walls and foundations. It also enables the floor to floor heights to be reduced which in turns minimises the height of the building, hence generating savings in cladding and on taller structures the possibility of introducing an additional storey. Post-tensioned slabs give flexibility for the layout of a building and is commonly used in structures with irregular grids, unusual curves and complex geometry. The inherent structural benefits of post-tensioned structures provides the Architect the opportunity to cantilever structures that would not normally be possible with more traditional forms of construction. The benefits of the post-tension system helps control the structures deflections that normally govern the design. 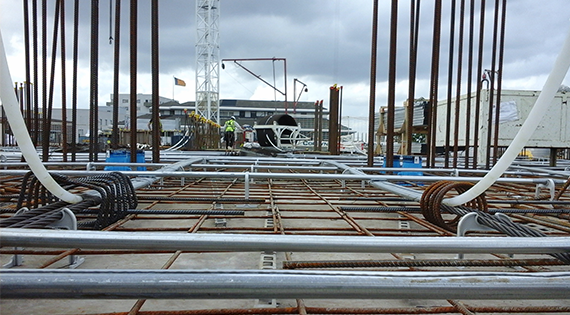 Post-tensioned slabs can span further than normal reinforced slabs therefore allowing a reduction in the number of internal columns and therefore reduction in the number of foundations. The reduction in columns creates more flexibility for the Architect for spatial planning. More economical design by reducing the quantity of concrete and reinforcing steel. Post-tension slabs can accommodate openings without too much difficulty. Smaller holes provide little problems as these can be formed between the PT tendons. The position of the tendons are normally marked on the soffit of a slab to allow for the formation of future openings a simple exercise. Many modern commercial buildings now utilise exposed soffits. Post-tensioned slabs can be designed crack free by designing the whole slab to be in compression under normal working loads however it is more normal to adopt a partial stressed slab that has limited crack width to 0.2mm. This makes them ideal to be used where fair-faced finishes have been specified. Post-tensioned slabs have fewer or no expansion joints the traditional reinforced slabs. Inherent fire resistance means concrete structures generally do not require additional fire protection. This reduces construction time, costs and minimises the use of a separate trade and eliminates the need for on going maintenance for applied fire protection. For structures containing post-tensioned slabs vibration criteria for most uses can be met without any changes to the design. For more sensitive uses such as hospitals and laboratories further enhancement may be required but this is less than other materials. Post-tensioned concrete slabs can be specified with recycled aggregate, plus have the benefit that at the end of its life both the concrete and steel tendons from demolished PT floors are 100% recyclable. The amount of concrete used in a post-tensioned slab can be up to 30% less than that required in traditional reinforced concrete slabs. This can lead to reduced embodied energy and carbon emission, a faster building program and fewer deliveries to site. Concrete mixes typically now contain cement replacements which lower the embodied CO2 and use by-products from other industries. Consideration needs to be taken to balance the environmental benefits of the cement replacements with the slow strength gain generated by these materials which in turn slows down the initial pre-stress applied to the slabs.